It’s funny how any inkling of food snobbery goes right out the window as soon as you have a child. Now if a recipe gets food on the table fast and still tastes delicious, far be it for me to judge if some of the ingredients came from a can. We’ve become heavily reliant on our slow cooker this winter, so we’ve been on the hunt for new and interesting recipes to try (major bonus points if they’re easy). We recently came across this new twist on pot roast in this cookbook, made a couple small tweaks to make it even easier, and loved how it turned out – hope you enjoy it too! Note: this recipe could easily take more heat – feel free to add some fresh jalapeños with the first ingredients if you like! Place first 6 ingredients and roast (or stew meat) into slow cooker. Pour tomato mixture over meat. Cover and cook on high 5 to 6 hours or until meat shreds easily with a fork. Skim fat from juices in slow cooker. 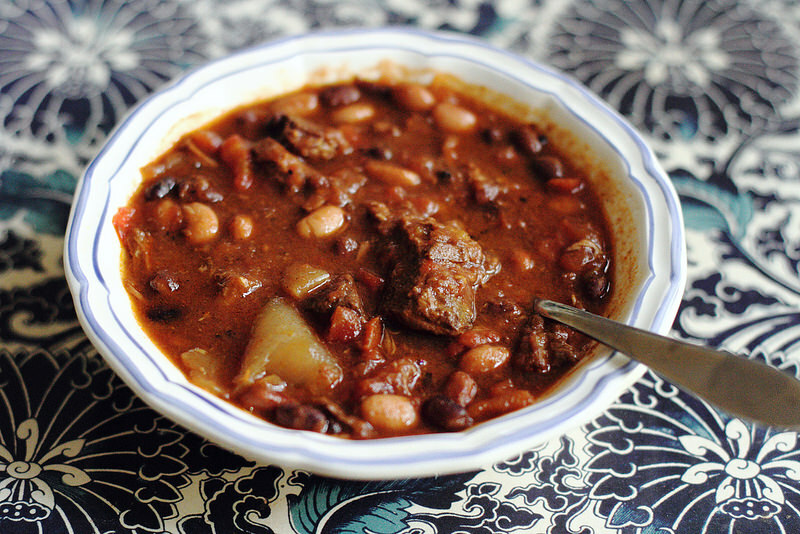 Stir in black beans and pinto beans. Add roast pieces back to slow cooker; cover and cook on high an additional 20 to 25 minutes. Top each serving with jalapeño pepper slices, shredded cheese, or sour cream if desired. This looks like the perfect thing to have on a cold day.